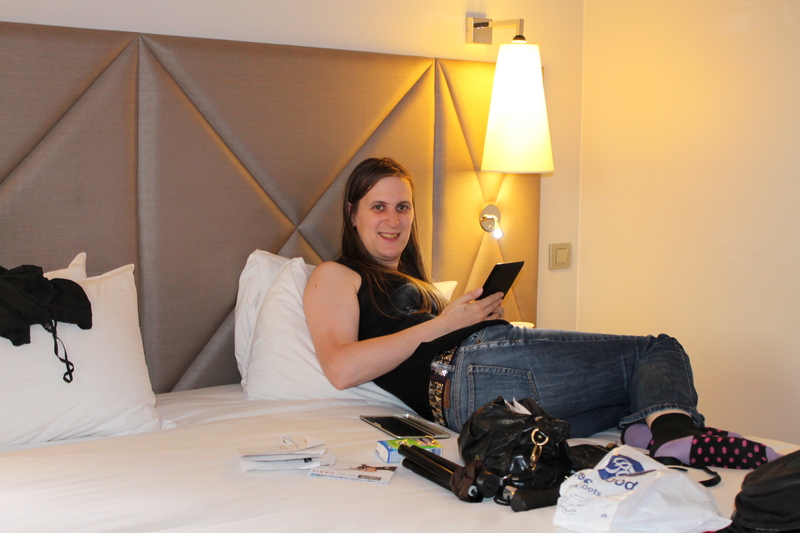 Louise relaxes in our room. After a confused slog across Paris via two Metro¹ lines, we ended up at the Boulevard Berthier where stood our hotel for the weekend. On the plus side, it was clean, had free wi-fi and the staff were very friendly. However once in the room we found that not only was it very small (to a scale where we had to duck under the towel rails to get into the shower) but that the safe (which we were meant to programme a code into) had been locked by a previous guest in the open position, and there was no way short of a locksmith to change that, and also that the kettle was broken, though at least it worked. We needed liquid more than we needed to go out to the bar so I made us tea and coffee. What was provided though were some individual sachets of Nescafé and some weird tea bags (one black tea and one mint infusion). Now, I had been led to believe in the past that the Nescafé in France was somehow better than that available in the UK. I now, once and for ever refute this allegation. It’s every bit as disgusting as the English variety! Nevertheless, it was getting late and we had an early start next morning and so we went to bed. 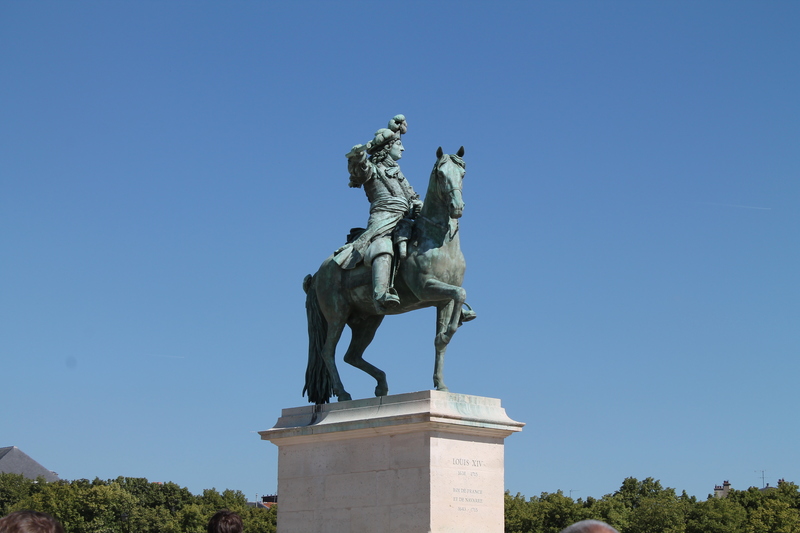 Day two was spent in Versailles. After an eventful journey getting there, including a drunken young man at a railway station who wanted to sell us cocaine, (he’d have had more luck if it were wine, to be honest) we eventually disembarked at the local RER station and decided to avoid the massed crowds heading to the Château by getting a coffee and breakfast sandwich first. Of course, since it was morning, the café didn’t have sandwiches (it was too early), so Louise had a can of Orangina and a cake, while I had a cappuccino. It’s an odd thing about France that while they will frown and look aghast at the concept of a baguette in the morning, they are more than happy to eat cakes and sweets for breakfast. If I’d wanted a bowl of trifle or a blancmange, they’d have been fine… Weirdos! Anyway, having caffeinated, we headed for the Château pausing only at the tourist information office for tickets. The queue for the main building was about 8 kilometres long at this point, so we decided to see the grounds and gardens first, which only had a queue of about a dozen people. This proved to be a good move as we were just in time for the Musical Fountains Show in the main gardens, which was something we both wanted to see. 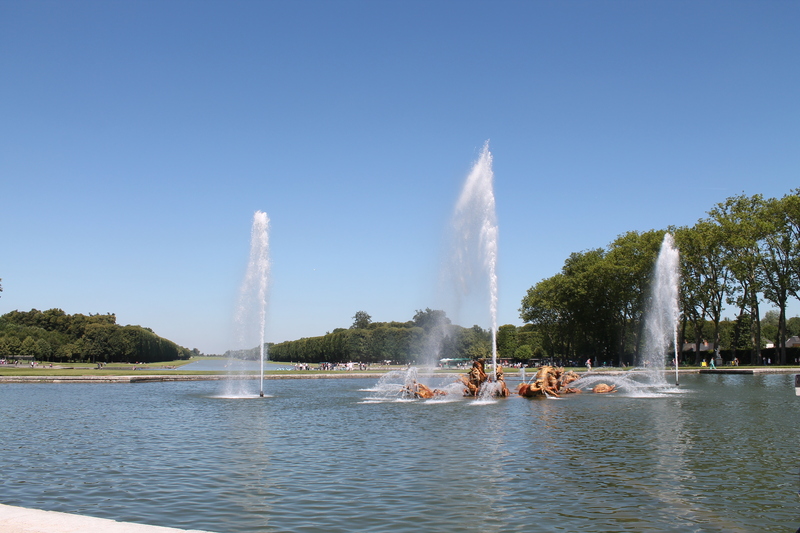 Now I think I had set my expectations too high for this, since I expected something similar to what you’d see in an English royal park or the Southbank, with fountains set to music in a somewhat quirky display, only in a more refined and I daresay French manner. What we actually got was the fountain turned on though with a constant stream, and classical music played through speakers around the gardens. Oh well, it was very pretty nevertheless, which set us up for the incredible gardens that followed. After a stroll round the gardens, we headed towards Marie Antoinette’s retreat and hamlet towards the north end of the estate where we had a light lunch of a chicken salad and a glass of wine before proceeding to the buildings proper, the first of which, The Grand and Petit Trianon can be seen below. It is of note that though the billiard table in the last image was there in the time of Marie-Antoinette (or at least one similar), she had the room outfitted as a small dining room and not as a games room as one might expect. By this time, in fact I think before now, my feet had given up and gone home without me, and I was left to rely on my stumps and walking cane, which I was oh so glad to have brought with me, and may have forgotten had Louise not reminded me to pack it on Friday. I was leaning on it for the entire remainder of the trip and still am as I write up this post. We finally came back to the Château proper where the queues were finally down to less than a kilometre long, and after a short wait, we were through security and inside. Unfortunately, it was comparatively dark inside and what with a ban of flash photography (not that it stopped everyone of course) it meant that the inside photos were taken with a slow shutter speed, often just 1/6 second, and so I hope you’ll forgive any associated blurriness. I was by now rather unsteady even with the stick, and well, one needs two hands to operate a camera. By this time, I was so bad that the security people took pity on my and offered use of a lift back to the ground floor when they saw the look of absolute dread on my face when seeing the stairs. This was another thing that lasted the remainder of the trip, and I’m thankful to those people (not least Louise) who got me through crowds and into the exhibits. We eventually made it back to our hotel, and settled down to a lovely evening meal. I couldn’t have made it any further than the hotel restaurant if my life depended on it. So, with a bottle of house wine to share, we ate food and then sat in the bar drinking Leffe Ruby while a group of Germans watched the football on telly. Next morning, we had a plan to have breakfast on the Eiffel Tower at 8 or so, and then go on to see other sights. It didn’t quite work out. We woke about 8:30 and were barely up and showered by 9am. We both ached and were somewhat sunburned about the shoulders from the hot sun on Saturday. Still, we had a day to fill and so we headed out to the tower later than planned. As it happened, the Eiffel Tower is currently undergoing renovations, and one entire leg was closed off, along with most of the first floor. Therefore, as well as our early breakfast, we also missed out on champagne before lunch. Ah well, c’est la vie, at least we got there. With Louise stomping her foot, a helpful staff member helped usher the decrepit one (aka me) through the crowds and into the lifts in what I considered an unfairly quick time. I was feeling sorry for the people waiting in line, but as Louise said, there was no way on earth I could have stood that long. We had a sandwich² on the second floor with a glass of wine, which was a bit rushed since we couldn’t sit down anywhere to eat, and after a wander, we left to visit the Musée d’Orsay. On arrival however, there was another massive queue, and so, noticing the smaller Musée de la Légion d’honneur across the street, we visited there instead. It was a delightful collection of military (and other) decoration. The French do like their medals, I must say. It was fun, but even that was too much for my poor legs, and after seeing just the one floor, we decanted to the café across the road for a wine. We spent the remainder of the afternoon in another small café near Gare du Nord drinking Leffe and eating salad, before it was finally time to head home. All that remains is to thank everyone who helped and supported me when my legs failed this weekend, especially my Loufing of Burden, who did a very good impression of Skyrim’s Lydia all weekend, although she did say that just like Mjoll the Lioness (also Skyrim), she can carry a good bit of kit! Thank you Louise, and thank you to all to helpers who got me through it in one piece. All photographs in this blog post are copyright © Siobhán Keane 2014 and were taken either by myself or Louise Newberry using either a Canon EOS 1100D or with our phones. Mostly the former. ¹ The Paris mass-transit system seems set up to be at the same time both quintessentially French and mind-bogglingly confusing. Between the Metro, with its numbered lines and the RER (Réseau Express Régional) with trains with girls names like Mona, Nora etc. I was half expecting (due to it being during a music festival) to see a party train called Lola. It’s also strange that they have single deck buses and double deck trains, but that’s another thing. ² We wanted chicken salad, but due to a language problem, the server couldn’t understand Louise and we ended up with cheese. Funny, I thought French bread was supposed to be good, but most of what we had, anywhere, tasted stale and wanting. I was glad to be home, foodwise.